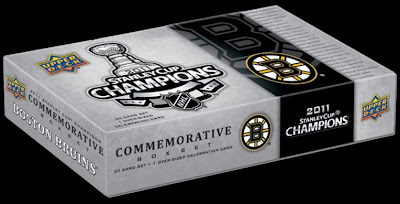 Upper Deck is releasing a boxed set commemorating the Boston Bruins victory in the 2011 Stanley Cup Finals. It is available for order now, but will not ship for a few weeks. Priced at $19.99 (plus shipping), the set will consist of 31 cards. The breakdown is as follows: 25 cards featuring the best Bruins … Continue reading "2011 Boston Bruins Stanley Cup Champions Set"